OilSoup: What's Up With Theo Peckham? What's Up With Theo Peckham? Five frustrating years, that's how long Theo Peckham has been trying out for the Edmonton Oilers. It's been 150 games and the time has come for the Oilers to decide if Peckham is part of the rebuild. The 24 year old is in the last year of his contract and Steve Tambellini will have to determine if Theo is worth making an offer to retain his rights. Peckham made a little over one million dollars, so the Oilers will have to give him a ten percent raise so Peckham can remain a RFA. Based on his level of play this year, I can't see the Oilers offering him a new contract. Peckham has had little luck this year when dealing with the officiating. His foot speed and decision making skills is not up to speed to play in the NHL. If Tambellini does offer another contract, it will be centred on Theo's potential. The Oilers have found themselves in this position before. It was only a few years ago that the Oilers traded a developing big punishing defender. Today that defenseman is a major piece in one of the best defences in the league. At the age of 28, Matt Greene is one of the premium stay-at-home defenseman for the Los Angeles Kings. As an Oiler, Greene had trouble staying out of the penalty box; he was reckless and struggled with the speed of the game. Greene played 150 games over three years for the Oilers, developing into the defenseman he is today. Matt Greene was a better prospect but there are similarities between Peckham and Greene. Both play the same style and both players have a niche of taking stupid penalties. Peckham brings a style of play that is needed on the Oilers blueline and it could be a mistake to let Peckham go. He is tenacious and isn't afraid to get dirty while protecting the front of the net. There is no knocking his willingness to compete night after night; a quality that is lacking on this team. Unfortunately Peckham is currently a liability on the ice, his foot speed and on ice awareness is not up to NHL standard. For a team that often struggles to move the puck, Peckham's puck moving ability goes no further than dumping the puck. It's been a difficult year for Theo, especially since having a breakout season just last season. With defenseman Jeff Petry and Corey Potter having breakout seasons this year, Peckham will be hard pressed to play any more games this year. Although Theo brings a different element to the ice, the Oilers do have prospects moving up the depth chart. One defensive prospect in mind is Colten Teubert. The former first round draft pick brings the same moxie to his game that Peckham is well known for. The fact that Teubert is waiting in the wings makes Tambellini's decision that much easier. 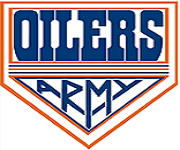 The situation will become more challenging for Peckham, perhaps the Oilers will retain his rights and give Peckham a chance to compete for a spot at training camp next year. If he's unable to earn a spot, the Oilers can trade him or waive him; either way he will no longer be an Oiler. Or the Oilers will simply cut their ties this Summer and watch another defensive prospect go to the wayside. In six months, Oiler fans will hopefully know what's up with Theo Peckham. Here's hoping that Theo Peckham becomes a little faster and a little smarter. Here's hoping the he becomes the next Matt Greene. Here's hoping that Theo becomes a shutdown defenseman for the Edmonton Oilers! Peckham just isn't a very good player. He was always at best a 3rd pairing defenseman. His physical play aside, everything else about his game lacks. No tool box and not enough tools. There's no doubt he has struggled this year but he did have a breakout year last season. We all know that it takes time for defenseman to develop and this is certainly the case for Peckham. With a little more time he might develop into a solid NHL player. He's still young enough to work on his foot speed and with more experience he should read the play better. Or he'll become a minor league player.